Recipe feature from The Food Matters Cookbook: 500 Revolutionary Recipes for Better Living by Mark Bittman (Simon &amp; Schuster, $35). Note that the prep time does not include chilling - plan ahead! Put ½ cup of the sugar and the water in a small, heavy saucepan. Turn the heat to medium-low and cook, shaking the pan occasionally (it’s best not to stir) until the sugar liquefies, turns clear, then turns golden brown, about 20 minutes. 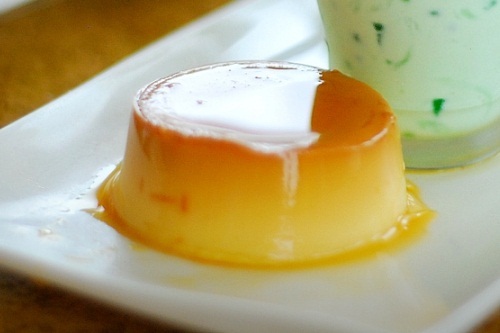 Immediately pour the caramel into the bottom of a medium glass bowl or gelatin dish, or four 6-oz ramekins. Put the coconut milk in a medium saucepan and sprinkle the gelatin over it, let sit for 5 minutes. Turn the heat to low and cook, stirring, until the gelatin dissolves entirely. Put the tofu, vanilla, salt, and remaining 2 Tbs sugar in a blender or food processor and puree. Add the coconut mixture and blend until smooth. Pour the custard into the prepared bowl or ramekins and transfer to the refrigerator. Chill until set, at least 4 hours up to 24 hours. Serve the flan from the bowl (with a big spoon for scooping out the caramel) or ramekins; or dip the bottom of the vessels in hot water for about ten seconds, run a thin knife all around the edge, and then invert onto plates, scraping the sauce over all.